BNEWS.VN – Binh Thuan province is one of the driest countries, however this is a favorable condition for the development of solar power, a clean energy source in the world is being directed to. As planned, 2030 Binh Thuan province could attract investment in the development of solar energy projects with a total capacity of over 4,000 MW. This is one of the favorable conditions to Binh Thuan became the center of clean energy in the future. Besides, far PPC text also approved the survey, investment research for nearly 30 solar power projects for registration of geographical deployment Binh Thuan; while 2 projects were set up additional development planning provincial electricity and the Ministry of Industry and Commerce approved the Plant Solar Eco Seido (capacity 40 MW) Power Station Solar Da Mi (capacity 47 MW). Mr. Nguyen Ngoc Hai, Chairman of Binh Thuan said, for planning the development of solar power, the perspective of the province is creating favorable conditions for raising capital from economic sectors to exploit the advantages of energy resources and land in an optimal way. This planning is also associated with the development strategy common energy and harmony with the development of other economic sectors, bringing economic benefits – socially practical, just consider the development of solar power for the area agricultural production or development in other industries unfavorable, low economic efficiency. Problems attracting investment in the province is a dramatic change in the direction of encouraging the development of clean energy in line with the economic sectors spearhead, to gradually realize the goal of becoming the center of energy (wind, heat electricity, solar power, …) of the country in 2020 with a total capacity of 12,000 MW on. For Binh Thuan is local solar energy potential among the highest in the country, high thermal and radiation stability. Solar field local at currently attractive large investors, the government encouraged investment interest. 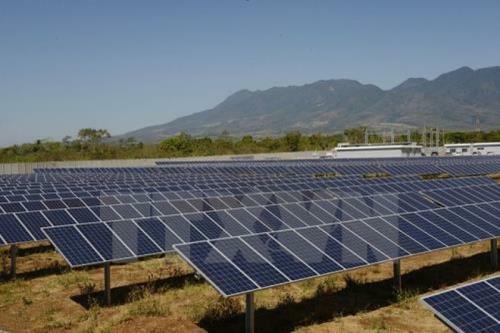 Therefore, selecting, orienting development of solar power in the province of Binh Thuan in the future to attract economic sectors have the capacity and experience to participate mining resource advantage of solar energy , land use an effective way to promote economic restructuring and development of the energy industry, contributing to ensuring national energy security. As planned, 2030 Binh Thuan Province can attract investment and development projects solar energy plant on the 4,000 MW total capacity. This is one of the favorable conditions to Binh Thuan become the center of clean energy in the future.